The incident occurred while the aircraft was preparing to take off and hit two helicopters parked 30-50 metres from the runway. 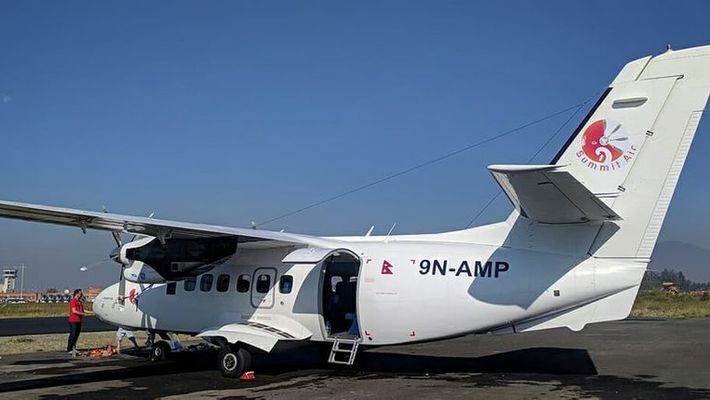 A co-pilot and two policemen were killed when a Summit Air plane skidded off the runway during take-off and collided with two parked helicopters at Nepal's Lukla airport on Sunday. According to Nepalese media, Tribhuvan International Airport spokesperson Pratap Babu Tiwari said that S Dhungana, co-pilot of the plane, and assistant sub-inspector Ram Bahadur Khadka, who was stationed at the helipad, were killed in the incident. Assistant sub-inspector Rudra Bahadur Shrestha, who was injured in the incident and airlifted to Kathmandu, died after being bought to the hospital. Captain RB Rokaya who was flying the aircraft and Captain Chet Gurung of Manang Air, who was in the helicopter, were also injured in the incident. They were rushed to the Kathmandu's Grande Hospital and are said to be out of danger. The aircraft had hit the helicopters of Manang Air and Shree Air. Lukla airport, also known as Tenzing-Hillary airport is often referred to as one of the most difficult and dangerous airports in the world because of a short runway (527 metres) and challenging terrain.